The Intelligent Systems and Assistive Technologies (ISAT) Lab successfully led an experiment showing that its improved augmented reality (AR) telementoring system can significantly increase safety in remotely-directed medical procedures. 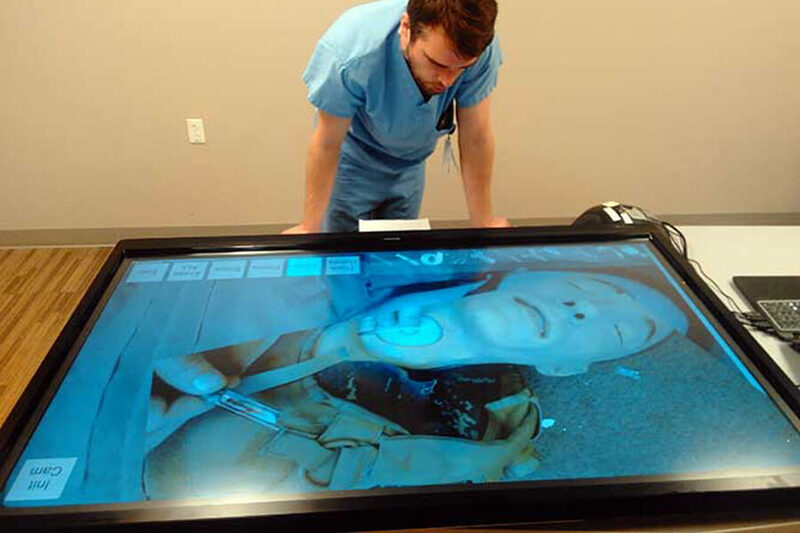 In Indianapolis, a surgeon mentor used augmented reality to view the remote mentees’ operating field, and then gave surgical instructions onscreen. Under the guidance of Juan Wachs, the James A. and Sharon M. Tompkins Rising Star Associate Professor of Industrial Engineering, PhD student Edgar Rojas Muñoz and other graduate students used ISAT's System for Telementoring with Augmented Reality (STAR) to help direct medical corpsmen to perform a remote medical procedure. 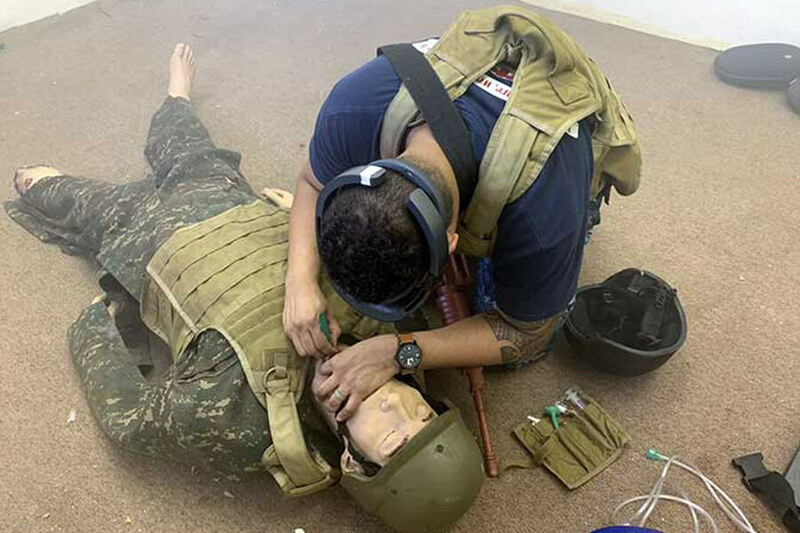 The experiment simulated a battlefield emergency surgery, and expert Indianapolis surgeons worked with Naval Medical Center Portsmouth (NMCP) medical corpsmen in Virginia to perform a cricothyroidotomy (opening an emergency airway) procedure on a “patient simulator” (mannequin). The goal of the experiment was to assess the latest version of STAR based on an augmented reality head-mounted display, evaluating STAR in an “austere” (battlefield) simulation setting. The validation was done in an NMCP facility which has simulated battlefield conditions such as background smoke and sounds of gunshots and explosions. The experiment compared STAR to another telementoring approach, audio-only communication. Twenty NMCP corpsmen (mentees) were remotely guided by the remote team expert surgeons (mentors) in Indianapolis to complete a cricothyroidotomy procedure on a patient simulator. At the same time, on-site NMCP personnel evaluated the participants in terms of completion time, performance, and safety. The experiment took an entire day to complete. Each participant did two approximately five-minute repetitions of the cricothyroidotomy procedure, one per telementoring condition. The two telementoring conditions were: 1) STAR, and 2) audio-only communication. Muñoz directed the experiment in Indianapolis, while Sanchez and Lin directed the Virginia site. Results showed that when using STAR, participants obtained significantly higher procedural scores than with audio-only communication, did not take appreciably longer to complete the procedure, and performed more safely overall. In Virginia, an NMCP mentee used augmented reality to perform a cricothyroidotomy on a patient simulator according to the surgeon mentor’s instructions. Purdue Team: 2 IE graduate students (Natalia Sanchez and Juan Antonio Barragan) and 1 CS graduate student (Chengyuan Lin) + 1 CS faculty (Dr. Voicu Popescu). Although this experiment's purpose was not to compare a controlled setting (like at a university) with a battlefield situation, Muñoz and his team did see significant differences.“It was very interesting to see the way in which the military managed things - everything was on time, not a single detail was out of place,” said Muñoz. “Coordination was key to performing this experiment, with the team geographically divided." This was the last experiment in the original grant proposal, titled “See-What-I-do: Increasing Mentor and Trainee Sense of Co-Presence in Trauma Surgery with the STAR Platform”.